Remove front clip and pull motor? My 4.4i is approaching 125k miles and I think the timing chain guides should be replaced. I also have to change the valve cover gaskets. There is some other stuff that needs doing and I am wondering if I could pull the motor with the transmission and transfer case attached by removing the front clip and releasing the sub frame. Pretty much like XO member "Stunt" did in page 11 of the thread linked below. However, I don't have the luxury of a lift. The whole assembly (motor, AT, TC & sub-frame) would have to come out toward the front of the car. I can probably raise the car 8" - 10" before I start work so that there is a bit of play for the assembly to go down before coming out forward. I had the AT out before and splitting the motor from the AT is a bear (w/o a lift). I don't have enough overhead space to lift the motor upward out of the engine bay. It seems possible to take the whole unit out in one go, sub-frame, front drive axles, hubs and all by going forward. I am wondering in particular if the engine will clear the square plates on the front of the chassis coming out forward?? Any thoughts on the geometrical challenge faced here would be appreciated. Why would you pull the motor to change the chain guides and valve cover gaskets? Just remove the radiator and you'll have plenty of room to get all your work done. Monocoque chassis vehicles like the X5 don't have a front "clip" - that is a concept on ladder chassis vehicles, where the panels do not form a structural component. Removing a "clip" involves basically all front panels - including guards, inner guards, rad support etc all as one unit. This is not possible on an X5. Audi refers to removing the front clip to the service position on their later cars in order replace the timing belts. As far as I know all Audi cars and SUV are designed on a Monocoque platforms. No idea why you would pull the engine to do either of those jobs. 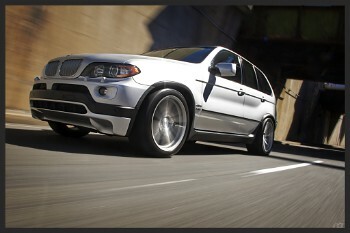 The X5 has more room in front than an e39 or e38 with an m62 and no one removes the engine in those either. If you really want more space you can remove the radiator support, front fan, condenser, trans cooler, etc but that is going to require ALOT of unnecessary work and recharging your AC after the job is done. You mention doing the VC's as if its a separate job even though you have to remove them to lock the cams. Remove the cooling system and go at it. Plenty of room to work in timing chains with the radiator removed. I was even able to get a 3/4 inch impact in there to remove the crank bolt. Its actually not that bad. Just have to take your time and understand how it works before you start tearing it apart. As long as you dont try and do it in a weekend you will be fine. HAHA... I plan to do it over a month if I have to. Needs: VC gaskets, upper TC gaskets, maybe lower TC gaskets, alternator housing gasket, valve stem seals, doing the coolant transfer pipe and valley pan as preventative maintenance, and it needs motor mounts. I'm sure I'll find more "while I'm in there" parts to replace as well.